Human remains found on board the Mary Rose are starting to reveal their secrets after nearly 500 years on the sea bed. 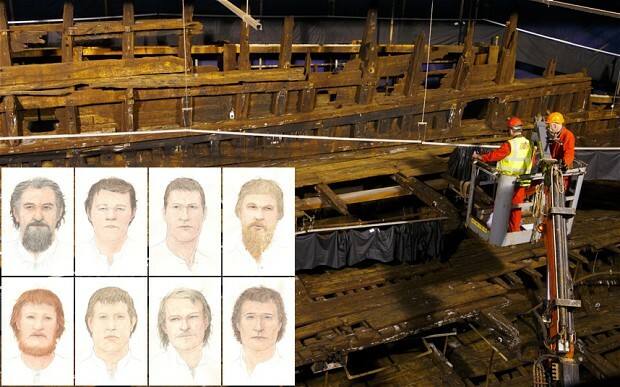 They spent nearly 500 years in a watery grave with no record of who they were, but now the crew of the Mary Rose, Henry VIII’s ill fated flagship, could finally be identified. Scientists have begun work to extract DNA from the bones that were found on board the Tudor warship when it was raised from the bottom of The Solent 30 years ago. They hope to use the genetic information to identify the men who perished on the vessel when it sank and perhaps even trace their living relatives. It comes as a new £23 million museum built around the preserved remains of the ship, is due to open on Friday. Archaeologists working on the Mary Rose have already made some progress towards identifying those on board through analysis of their bones. Three dimensional scans of 10 skulls found among the wreck have been used to produce artists impressions of how a handful of the crew would have looked. Analysis of the bones and personal belongings of those found on board has also allowed scientists to determine what many of their roles were. Dr Nick Owen, a sports biomechanics expert at Swansea University, who has been leading the team examining the bones, said: “Ultimately we would like to find some living relatives, although there are no records of those who were on board so it will be like searching for one blade of grass in a field. “It would be marvellous if we could narrow it down to families and it is known that archers for example came from certain parts of the country like Wales, so that gives us a bit of a pointer. Dr Owen and his colleague Dr Sarah Forbes Robertson have been developing new techniques for extracting and analysis the DNA. They drill into the bone to reach a part that has not been exposed to the sea and so should be free from contamination from marine animals. They hope to get the first results within the next few months. Marine archaeologists found the remains of 179 individuals when they raised the Mary Rose from the sea bed close to the Isle of Wight. The discovery of human remains was initially kept secret due to concerns about the implications of disturbing a maritime grave but was later made public. The thick silt that had helped to preserve the wooden structure of the Mary Rose was also found to have helped protect the bodies of those on board. The identities of those on board was not known as only the names of the Vice Admiral Sir George Carew and the Captain, Roger Grenville, were recorded. There were 92 almost complete skeletons were found. Analysis of the bones has shown that most were male and under the age of 30, with the youngest being just 13 years old. Among the bones are some ribs and limbs that appear to have been broken and healed, giving some indication of how violent life on board could be. Research on arm bones has also revealed that archers on board, who were using large, powerful long bows at the time, had over developed forearms. Many also suffered from repetitive strain injuries in their shoulders and spines from repeatedly drawing the bows, which had bow draw strengths equivalent to lifting 200lbs. Six skeletons found clustered around a two tonne bronze gun on the main deck showed the five were large and strong men and their spines showed signs of new bone growth characteristic with heavy work. The sixth was a smaller boy who possible carried gun powder to the gun crews. Divers also found the remains of a man in a small store room that contained a chest with a large number of gold and silver coins. He was thought to be the ship’s purser. Reconstruction artist Oscar Nilsson has also used three dimensional printed replicas of one of the skulls found in the wreck to reveal the face of one of the crew members. This is expected to be revealed at the opening of the museum this week. Alex Hildred, part of the archaeological team at the Mary Rose Trust who has been examining the remains, said: “The remains tell a very human story of what life was like on board a fighting ship in the 16th Century. “The DNA should allow us to determine the hair colour and eye colour of those on board, but also look at some other aspects of their identity like their nationality. “Some of the people on board will have been local to the Portsmouth area so there may even be relatives still living.